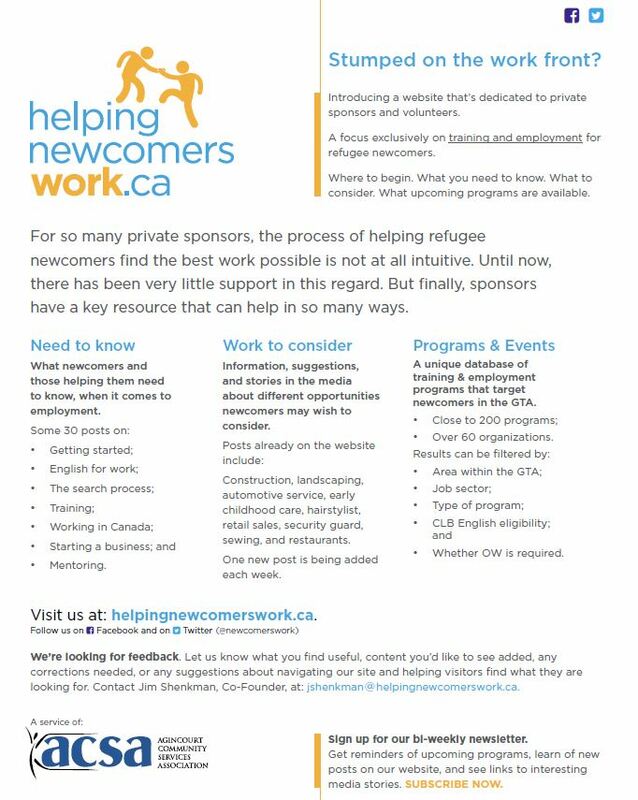 The Helping Newcomers Work project is an online platform that provides resources for private sponsors and volunteers to help refugees find the best work possible. The vision behind the Project is that every refugee newcomer to Canada should be helped by private sponsors or other volunteers, who have the necessary understanding of what his or her needs are and what can be done to help him or her find the best work possible. The Project encompasses the use of information and communication channels provided by an electronic, digital hub, consisting initially of a website helpingnewcomerswork.ca and Facebook page, with later integration planned of other social media tools, such as Twitter, YouTube, and WhatsApp. The primary geographic focus for the target audience is the Greater Toronto Area. However, much of the information being provided will be of value to private sponsors and others helping refugee newcomers across Canada.